As an ambitious owner of a small business, there must have been times, when you ran out of ideas to market the products or service that your business deals with. E mail marketing is one of the ways that you can use to achieve your marketing goals. As owner of a small business, you can take the help of an e mail marketing partner to reach out to you target audience. E mail marketing is regarded as one of the most efficient ways to stay connected with clients of your small business. Alongside, through e mail marketing, you can also promote your business. E mail marketing gives marketers the power and ability to reach out to huge target audience easily and effortlessly. You can do the email marketing activities of your business by yourself. We recommend that you take the help of a professional for the same. 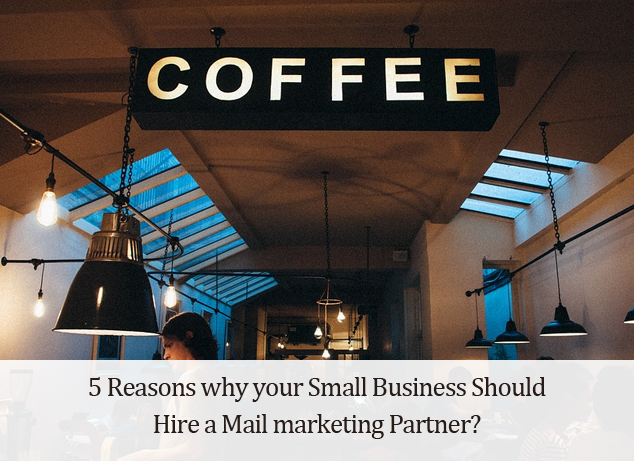 Here are 5 reasons why your small business should hire a mail marketing partner. When you have someone else take care of e mail marketing activity, for your business, you save valuable time. You can use this time to look into and manage the other activities of your small business that require your attention. You can pass on instructions on what you expect your e mail marketing partner to do. As business owner, you can keep tabs of what is being done by them. It is impossible for every small business owner to keep them update of the latest trends in the marketing or advertising world. Before you take the help of an email marketing partner, you can check out their experience in mail marketing, social media marketing search engine marketing and other forms of marketing that are being used. No small business can be taken for granted. Every business regardless of its size and nature works on a mission and has a vision. On behalf of your business, when you partner with an e mail marketing service provider, you can share your business goals with their support. Every marketing effort is directed towards target audience. The same holds good for email marketing as well. When you partner with a professional you can experience a professional tone in all the email marketing activities of your business to successfully reach your target audience. Your marketing partner would draw out a plan, create a strategy and help you achieve your business goals through e mail marketing. When you take up doing e mail marketing activities for your small business, you could end up spending more than what you intended to. This could be because you might just have lacked the experience in e mail marketing. However, when you have a professional do the same for you on your behalf, you can be assured that they work on a budget. With the experience and expertise that your e mail marketing partner has, you can be assured that your project sticks to your budget. With e mail marketing, you could be working with software that is new to employees of your organization and to you. When you have a marketing partner take care of e mail activities of your business, you can be saved of the trouble of understanding how the new e mail marketing software functions. When it comes to using the new software, you can have your staff trained by your e mail marketing partner. E mail marketing when used in combination with other marketing activities can prove to be a very powerful tool for your small business.